More people are satisfied with the smartphone they own and have no interest to replace the device -- that's a problem for some vendors. Worldwide smartphone shipments will reach 1.46 billion units with a year-over-year growth rate of just 1.6 percent in 2016, according to the latest market study by International Data Corporation (IDC). Although growth remains slightly positive, it is down significantly from the 10.4 percent growth in 2015. 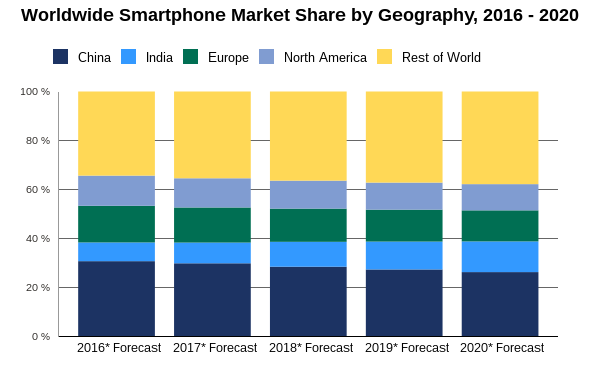 Much of the smartphone sales slowdown is also being attributed to the ongoing market saturation and decline expected in developed regions (such as North America) during 2016. Developed markets as a whole are expected to experience a compound annual growth rate (CAGR) of -0.2 percent, while emerging markets will experience a CAGR of 5.4 percent over the 2015-2020 forecast period. "Growth in the smartphone market is quickly becoming reliant on replacing existing handsets rather than seeking new users," said Jitesh Ubrani, senior research analyst at IDC. "From a technological standpoint, smartphone innovation seems to be in a lull as consumers are becoming increasingly comfortable with 'good enough' smartphones." However, with the launch of trade-in or buy-back programs from top vendors and mobile service providers, the industry is aiming to spur early replacements and shorten lifecycles. Upcoming innovations in augmented and virtual reality (AR/VR) may also help stimulate upgrades in the next 12 to 18 months. Consumer preference for larger screens is expected to continue and the growing interest in AR/VR could drive that forward as phablets (5.5 inches and larger) go from roughly one quarter of the smartphone market to one third by 2020. IDC analysts believe that as phablets gain in popularity, they expect to see vendors further expanding their portfolio of large-screened devices, but at much more affordable price points -- compared to market leaders Samsung and Apple. Over the past two years, high-priced flagship phablets from the likes of Apple, Samsung, and LG have set the bar for power, performance, and design within the phablet category. Looking ahead, IDC now anticipates many new phablets will reach the global mainstream market at considerably lower prices. Average selling prices (ASPs) for phablets are expected to reach $304 by 2020 -- that's down 27 percent from $419 in 2015, while regular smartphones (5.4 inches and smaller) are expected to drop only 12 percent ($264 from $232) during the same time frame. IDC expects that Android will maintain greater than 85 percent of the smartphone market. Google's introduction of Daydream and Project Tango will help usher in new use cases and will help participating hardware vendors to offer differentiated experiences in the premium segment.